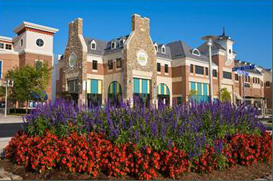 Located in Loudoun County Virginia, 30 miles Northwest of Washington, DC, Ashburn is a fast growing suburban area. Loudoun County was declared the wealthiest county in the country for two consecutive years, and the growth and development in Ashburn is testament to that. Ashburn consists of many major and minor subdivisions and within those hosts over fifteen public elementary schools, six public middle schools and four public high schools as well as several private institutions and three Higher Learning Campuses. Located conveniently in the Dulles Technology Corridor, Ashburn is home to many high-tech businesses and its close proximity to Dulles Airport and major thoroughfares such as Routes 95 and 495 make it a commuter’s delight. According to Money Magazine, it is estimated that 50% of the world’s internet traffic runs through Loudoun County as it is home to data centers for several major companies such as Facebook, Amazon and Microsoft as well as the large Verizon Campus formerly MCI Worldcom. These well-paying technology careers coupled with relatively affordable housing costs serve to create a wealth of diversity and opportunity that has led to the Ashburn areas popularity. Ashburn’s beginnings can be traced back to the 1720’s and the area was originally referred to as Farmwell or Farmwell Station. George Lee a decendant of the original land owner, Thomas Lee, referred to the 1,236 acre parcel as Farmwell in his will. In 1841 a portion of the land was purchased by Quaker Lawyer and almost Vice President John Janney as a summer home. He named the area Ashburn Farm after a family friend with the last name Ashburn. The land was later home to Senator William Morris Stewart. Ashburn went from an agricultural village to a commercial hub with the arrival of the railroad in 1860 and also served as a summer retreat for people escaping the heat of the city. Ashburn is home to four registered historical landmarks: Belmont Plantation, the Broad Run Bridge and Toll House, the sanctuary of Ashburn Presbyterian Church, and Janelia Farm. While there are no historic battlefields in Ashburn itself, the area is rich with Civil War History and accounts of camps and Potomac River crossings in the nearby Lansdowne area.